Alfred Eaker has concocted a strange and lovingly disjointed documentary about Raymond, called simply Thunder-Sky. Which probably is the only way to do it: Raymond’s significance really does not come from his status as an “outsider artist,” as much as his unique self-created persona, his self-imposed and beautifully freaky monarchy over a universe of buildings being built and buildings being destroyed. The drawings are simply evidence of his reign. In other words, “art” and “life” were never fully compartmentalized in Raymond’s psyche and practice; in fact he seemed hell-bent on blending them into a cement-and-cotton-candy dream-world only he could tell us about. We screened it Thursday night at Bromwell’s Gallery, asking for criticisms and corrections. And we truly got some insightful, wonderful ways to make it better. It was as if everyone in the room were completely invested in making sure Raymond’s life story is conveyed with as much style and class as possible. Eaker’s movie is high-style at points (beautiful animation done by Todd M. Coe is kind of like the movie’s “tent poles,” offering a funky, psychedelic structure to the ongoing talking-heads-ness; a great ongoing motif involving the items Raymond collected in his toolboxes also helps to shape the narrative), and a little too campy in others (those weird clown vignettes really do need to go). Sometimes the interviews get redundant (he focuses too much, I think, on Bill and me), and I think he may want to revisit having Thunder-Sky family friend Larry Higdon more in the spotlight, as his voice/demeanor/gentlemanliness as he speaks about Raymond really is arresting and actually made me cry. No matter what though I just wanted to tell Alfred and his cohorts how much I appreciate all the work they have done. I know I’ll never completely understand all the hard work and many hours that have gone into making this movie, but I do appreciate the final result: you’ve taken subject matter that is very hard to comprehend and fashioned it into a funhouse mirror world of reflection and celebration. Raymond was born in Hollywood. Having a movie made about his life only seems like the next step in his evolution. As we embark on our third year of presenting unconventional exhibits of works by unconventional artists, I think we may have stumbled into what we are supposed to be doing. Of course we have Raymond Thunder-Sky to thank for this accidental and wonderful purpose. Our space, our purpose, our namesake — all of it seems to really come to life because we find worth and meaning in allowing the edges to be presented as the center of our world. The works may be a little rough sometimes (and other times beautifully smooth; “unconventional” often does not mean “raw” or “rough,” just completely unique), but what everything we do has in common is the uncommon nature of the artists who make the works. We’re dedicated to a Thunder-Sky, Inc. mission of finding and championing art made by people often not seen as worthy of a lot of attention or interest. We hope Season 3 brings as many surprises as the other two have. “Infrastructure: Abstractions by Alex Bartenberger, Evan Hildenbrandt, Chad Rasmussen and Michael Weber.” Opening reception January 6, 2012, 6 to 10 pm. Closing reception February 11, 2012, 6 to 10 pm. “Infrastructure” is defined as “the most basic level of organizational structure in a complex body or system that serves as a foundation for the rest.” The four artists in this exhibit foreground basic aesthetic structures and systems and transform them into the actual finished product. Their spare, color-rich paintings symbolize both obsession and resolution. Raymond Thunder-Sky’s drawings often fetishize the “infrastructures” of buildings, streets, and even social systems. In a portfolio of prints created exclusively for “Infrastructure,” we’ll be “abstracting” from some of Thunder-Sky’s most elemental drawings, allowing a new way to approach and examine his work not as representations but as preoccupations with what’s underneath both reality and the way we perceive it. “Small Potatoes: Self-made (and Repurposed) Knick-knacks, Tchtokes and other Curiosities.” Opening reception February 24, 2012, 6 to 10 pm. Closing reception April 14, 2012, 6 to 10 pm. 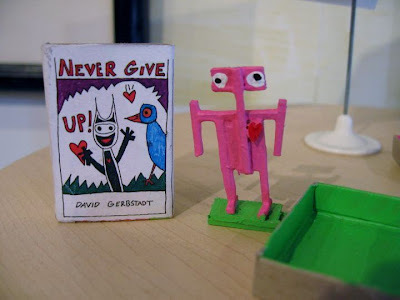 A group show featuring artists who create small, strange sculptures and paintings, intermingled with a collection of “knick-knacks” and “tchtokes” discovered in thrift-stores and other places. Each object and image will contribute to an overall installation reminiscent both of the TV show Hoarders and the vast magical expanses of landfills inside dreams. “Reverse Psychology: Katherine Michael and David Rizzo.” Opening reception April 27, 2012, 6 to 10 pm. Closing reception June 16, 2011, 6 to 10 pm. Florida-based artist Michael creates funny, funky, folk-arty cut-outs and paintings; they exemplify innocence and verve with high-energy hues and serendipitous subject matter. Cincinnati artist Rizzo’s work has more of a dream-punk flair: his paintings seem to be created by an odd-ball scientist/hobbyist/artist who collects cultural influences and creepy imagery with a vacuum cleaner and then through a vacuum-cleaner-bag autopsy reinvents and repurposes what has been sucked in. Their works side by side are a little like having an angel on one shoulder, the devil on the other — and sometimes you don’t know which is which, who is who, what is what. “Fly Your Own Freak Flag.” Opening reception June 29, 2011, 6 to 10 pm. Closing reception August 18, 2012. A group show of “freak flags” made by artists from across the region and the world. 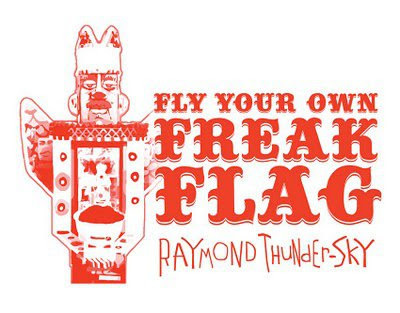 Raymond Thunder-Sky was his own personal freak-flag parade, walking through downtown and other areas of the city in clown/construction costumes that foregrounded his inner-freak and proudly announced to the world that he wasn’t to be messed with. We are asking freaks from an assortment of realms to contribute self-made flags that symbolize the spirit Raymond Thunder-Sky lived. We’ll also be asking a few of the freaks to fly their flags in Northside’s Fourth of July parade. “Unrealized/Unforeseen: Antonio Adams.” Opening reception August 31, 2012, 6 to 10 pm. Closing reception October 13, 2012. This is Thunder-Sky, Inc. Artist-in-Residence Adams first one-person show since 2009. He has been working on the concept for over a year, creating an epic portfolio of artworks in which famous celebrities (including Lindsay Lohan and David Hasselhoff) get “unrealized” (meaning returned to non-celebrity status), while unfamous folks (people Adams has selected from his everyday life) become major celebrities in his own personal cosmos. The media include paintings, drawings, sculptures, photographs, and video. We will also be publishing a glossy, full-color book documenting both the exhibit and the work and concept behind it. “Camera Shy: Photographs.” Opening reception October 26, 2012, 6 to 10 pm. Closing reception December 15, 2012, 6 to 10 pm. We will be featuring a group show of photographs from local self-taught photographers, including Polaroids taken by Raymond Thunder-Sky. It was a great two days at the Factory Square Fine Arts Festival in Northside. We heard over and over that our shipping container gallery was one of the best and funnest exhibits in the festival. What we did was very simple and to the point (like Raymond’s drawings). A bunch of painted cardboard boxes representing windows and bricks could be fashioned into buildings. We hung up a wrecking ball for people to use once they had constructed their buildings from the boxes. Easy as pie, and somehow very satisfying. What surprised me the most is the age range: lots of little kids of course, but also young adults and a few older ones came by to build their own city block and destroy it. ﻿Some of the works in “Direct Contact: Self-Made Pop,” opening October 22, 2011 with a reception 6 to 10 pm at Bromwell’s Gallery, downtown Cincinnati. “DC” surveys aesethetic universes created from glitter, trash, and desire. These artist are self-made and use what the world has given them to make distinctively weird and eerily precise works of art. Primary inspiration for this gig: Raymond Thunder-Sky. Raymond made drawings about construction, destruction, and the blank, supernatural swirl of things coming together and falling apart. His precision mocks makeshift road signs; his vision destroys and reinvents the way you take in the normal world. Larry with some of his masterpieces; directly next to him on the right is Han Solo after he has been carbon-frozen in Empire Strikes Back. Ran revealing his true self. ET is about celebrity and blockbusters and the slightly askew feverdream called the Entertainment Industry. Ran and Larry’s work use “entertainment” as a jumping off point to find personal myths and vision based on what is already in the public imagination: they make private pictures from public spectacles. Ran’s poster for the show. “Spaghetti Western” is a show Thunder-Sky, Inc. has curated as part of a larger show called “Cincinnati Dreams Italy,” a School Amici production hosted by School Amici and Western-Southern Financial, Inc. “The Dream” is a companion exhibit to “George Inness in Italy” at the Taft Museum. Inness’ inspiration spills out into the neighborhood to historic buildings around Lytle Park where some of Cincinnati’s most talented artists explore America’s continued fascination with Italy in paint, print, paper, stone, metal, fabric, clay and glass. Exhibition Dates: October 7, 2011 to October 23, 2011 – weekends only, when the Taft is open, 11am-5pm, other hours by pre-arrangement or special invitation GALLERY LOCATIONS 400 Pike Street, Cincinnati OH 45202 (Park Place) 311 Pike Street, Cincinnati OH 45202 (Near Lytle Park) 314 Broadway, Cincinnati OH 45202 (Old Police Station). Our location is 400 Pike Street which is directly next door to the Taft Museum. “Spaghetti Western” features the art of 17 incredible artists: Antonio Adams, Emily Brandehoff, Robert McFate, David Rizzo, Emily Bicknaver, Bill Ross, Dale Jackson, Mike Weber, Keith Banner, Kristen Vinci, Lindsay Whittle, Ervin Henderson, Ran Barnaclo, Brian Joiner, Leigh Cooney, Todd M. Coe, and Spencer van der Zee. You’re invited to a Progressive Potluck Preview OCTOBER 6, 2011 6 TO 9 PM.